The Centurion Twin SecureDoor is the ideal security solution for facilities looking for dual access. The two entrances and exits cater perfectly to high throughput buildings. Its design is stylish, spacious and predominantly made of glass with a slim steel frame to suit all types of facility designs. The telescopic motion of the Twin SecureDoor’s entrance ensures a smooth user experience, while helping prevent tailgaters from entering unmanned areas. The number one benefit of the Twin SecureDoor is it features two lanes meaning it’s ideal for high throughput environments. Of all the SecureDoors, it has the highest throughput rate of 12 people per minute. Given the nature of the SecureDoor’s sliding telescopic doors, it is a very user-friendly and welcoming option. The Twin SecureDoor is both secure and stylish due to its plentiful sleek glass panes and slim steel frame. Security is at the forefront of the design however as the glass panels are bullet and attack resistant and the portal is fitted with a range of advanced security features. This includes a sophisticated weight detection system that can analyse when there is a weight in the security booth that exceeds the pre-set thresholds, which indicates a potential an unauthorised tailgater attempting to access the facility. The SecureDoor also includes a door interlock system that ensures one door is closed at all times, ensuring effective anti-tailgating security. The Twin SecureDoor has a variant which does have one DDA compliant lane if this is a requirement for your facility. Given its double lanes, the Twin SecureDoor is a very spacious option and would suit facilities that have a reasonable area to dedicate to this portal’s larger footprint. 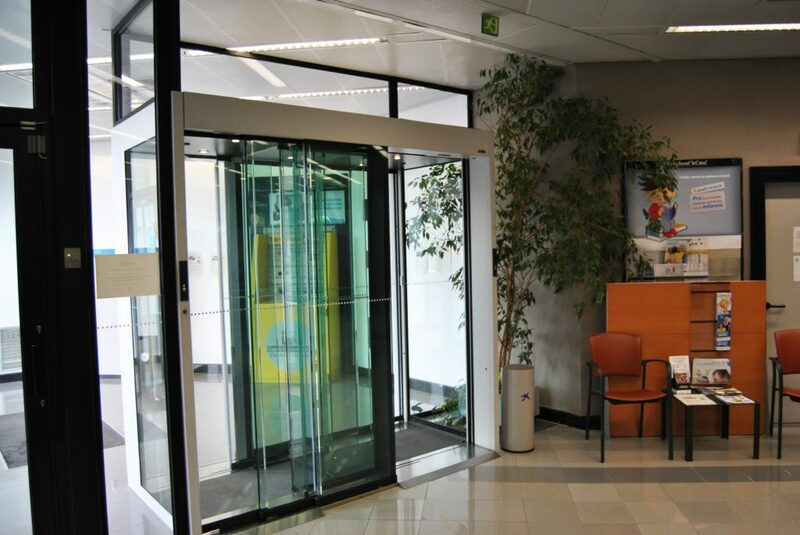 Safety is a high priority with this dual access SecureDoor. Its integrated with a fire alarm system which opens the doors in an emergency situation, it has an anti-panic button that can power down the last door that was opened so that it can be manually opened, IR safety sensors to detect any obstructions in the doorway before the doors close, and a battery back-up for power outage situations. Extra security options can be fitted to the portal, which includes options like biometric identification and CCTV footage. The Twin’s design features telescopic wings that slide either to the left or right of the SecureDoor and interlock to make an effective security solution. A VIP mode is available for special situations such as events, deliveries or important visitors. The tailgate detection system can be unarmed when in VIP mode so pre-authorised visitors can enter freely. The Twin SecureDoor features internal lighting to help create a more welcoming experience for visitors. Voice communication is available to help first time users navigate through the SecureDoor in unmanned situations.